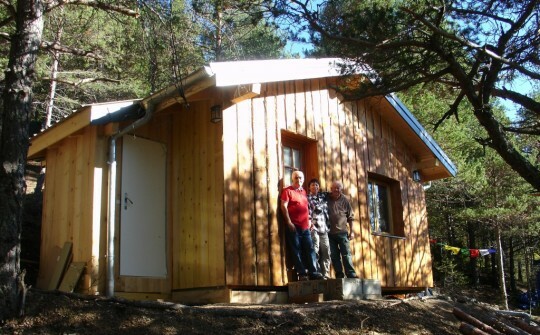 A kind benefactor has enabled the Supporting Ordained Sangha Fund to sponsor the building of a new IMI retreat cabin at Thakpa Kachoe Retreat Land, France. Due to the kindness of a generous benefactor, the Supporting Ordained Sangha Fund was able to sponsor the International Mahayana Institute’s building of a retreat cabin specifically to be used by Sangha at Thakpa Kachoe Retreat Land. This new cabin, named “Olka Cholung” after the place in Tibet where Lama Tsongkhapa did extensive retreat. It is run by Thakpa Kachoe and administered by IMI for IMI Sangha wishing to engage in medium-length and long retreats in Europe. 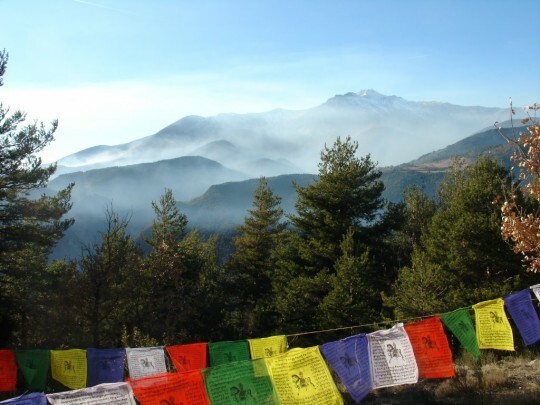 Beautiful surroundings at Thakpa Kachoe Retreat Land, where a new retreat cabin for IMI Sangha has been built. Thakpa Kachoe has twenty-two acres of pasture and forest and is located in the amazingly scenic South Alps region at Guillaumes in the hamlet of Villetale; a 1.5 hour drive from Nice. The cabin is a single room cabin with kitchenette, shower and adjacent dry toilet. Please rejoice in the building of this cabin which will benefit FPMT Sangha for years to come. You can learn more about the Supporting Ordained Sangha Fund and the ways it supports monks and nuns.